Nadal has just beaten Gael Monfils in the final of the Monte-Carlo Masters on clay 7-5 5-7 6-0. It’s his 9th Monte-Carlo Masters win, his 100th final and his 68th title. But it was not easy for the Spaniard. It was a spectacular, physically and mentally intense match, with an hour worth of breath-taking hot shots. The Monte-Carlo Masters is not a grand-slam and he didn’t beat Djokovic in the final, but this victory remains a milestone. It might even be one of the most important titles of his career. Here’s why. 1. It is his first title since Hamburg in 2015 and his first Masters title since Madrid in 2014. It’s been ages since he had a significant win, as 2014 was filled with injuries and 2015 was a year filled with deceptions and chock losses which made him move back to the number 5 spot in the world. He was playing badly, nervously, making uncharacteristic errors and losing matches he usually wins. He was a footstep slow and his forehand seemed gone. People were wondering if he would ever win another title, and if he should split with his coach uncle Toni who taught him how to play tennis, or if he should just retire after years of intense play gruelling on his body and mind. Finally winning a Masters title, on clay, beating successively top quality, confident players such as Thiem, Wawrinka, Murray and Monfils is a huge message to the locker room and a huge boost to his confidence. 2. The quality of tennis with which he won these matches is very high, even for his standards. He’s been consistently improving, hitting his forehand better and better and winning his final match point with his best forehand of the tournament. It might be safe to say his forehand is 90% back to top quality. His defence is back to top level and he negotiated well the drop shots, which were a piece of cake for him in his heyday. He played his best shots at money time, something he was struggling to do in 2015. He showed the mental toughness that made him a 14-time Grand Slam winner, defending a lot of break points. 3. In the absence of Djokovic, he’s been building some layers of confidence, something he’s been struggling with in the last couple of months because of some battering losses against his main rival. In Monte-Carlo this year, Rafa’s been improving with each match, and finished his matches stronger and more confident than he started. At the end of 2015, he won a couple of good matches at the World Tour Finals against Wawrinka and Murray, before being punished by Djokovic in the semis, pausing his improvement curve. He’s also started 2016 with a couple of good wins at Doha, before being completely destroyed by Djokovic in the final, leading to an early loss at the Australian Open. He lost again against Djokovic in Indian Wells in March of this year, but finally, in Monte-Carlo, Djokovic was defeated early by Vesely. Not meeting his biggest rival for a couple of matches and winning a final will enable Nadal to get the confidence he needs to improve and play his best tennis. Once he’s had a couple of wins in his bag, Nadal might have more confidence in beating Djokovic on his best surface which is clay. A similar scenario happened in 2013 when Nadal, after 7 months of injuries, was lucky enough not to meet Djokovic for a couple of months, slowly building some momentum and winning titles before facing his toughest rival, and beating him. 4. Historically, Monte-Carlo has been the most important title of Nadal’s career, even more so than Roland-Garros. It was the first tournament he won 8 times successively from 2005 to 2012. It was his career’s first big title he won back in 2005 when he was 18, beating one of the last true clay specialists Coria in one of the most epic and important finals of his career. It was the first victory against Djokovic in 2012 after 7 successive punishing defeats. This victory broke Djokovic’s momentum and gave Nadal the boost he needed to beat his rival in the French Open final of that year. It was the first big title of his comeback after injuries back in 2010, in a similar scenario to today where he hadn’t won a tournament for a long time. To conclude: Winning Monte-Carlo this year is a good sign for Rafa. 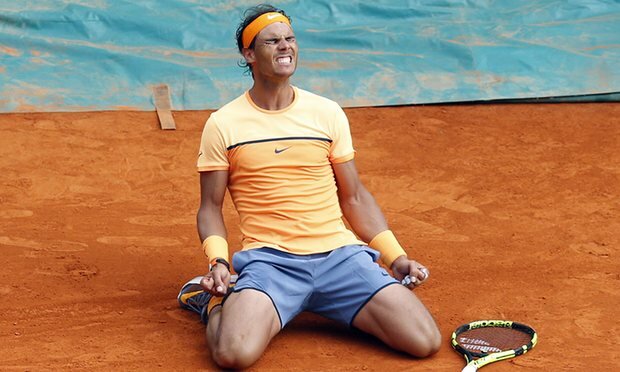 Nadal fans can only hope history will repeat itself, for good this time. I hope not…It would be such a loss for tennis!